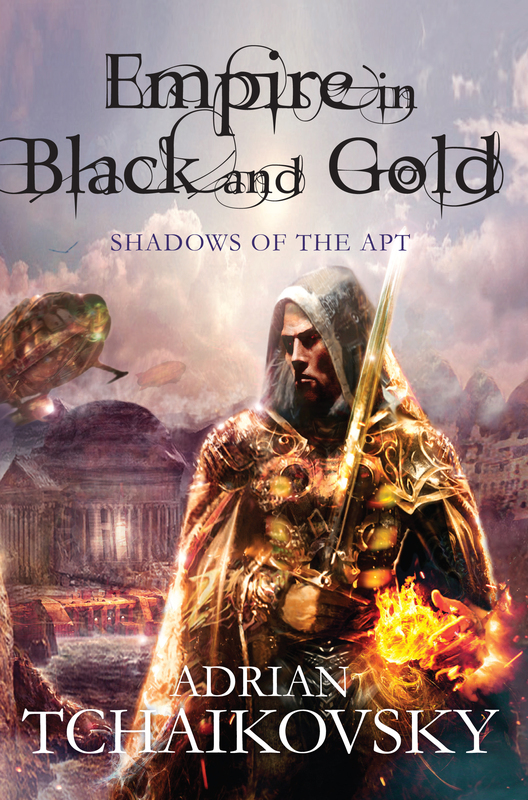 There’s taking the classic tropes of epic fantasy and putting a new spin on things, and then there’s Empire in Black and Gold. For those that don’t know, in Adrian Tchaikovsky’s Shadows of the Apt series, humans are divided into a host of different races or “Kinden”. Each one is linked to a different insect. There are Beetle Kinden, Ant Kinden, Wasp Kinden and more. They each have different physical and mental attributes which link in with the relevant insect, so Beetle Kinden are hard workers; they can fly, but only a little. Ant Kinden are great warriors, particularly as an army, due to their hivemind-like way of fighting. Wasp Kinden are great physical fighters who can fire stinging flames from their hands. If all that weren’t different enough, Tchaikovsky has also created a setting which is quite unlike anything else in epic fantasy. This is no medieval analogue; instead, we have an industrial setting, with steampunk-esque machinery and gangsters roaming the city-streets. And to highlight the importance of modern industry in this world, Kinden are either “Apt” or “Inapt”. An “Apt” Kinden, such as the Beetles, can understand complex machinery and technology but have no belief in magic or faith. An “Inapt” Kinden, like the Dragonflies, believe in magic first and cannot comprehend even the most basic technological mechanism. All this sounds like a lot, and whether it works depends on the usual staples of any good story: plot and character. 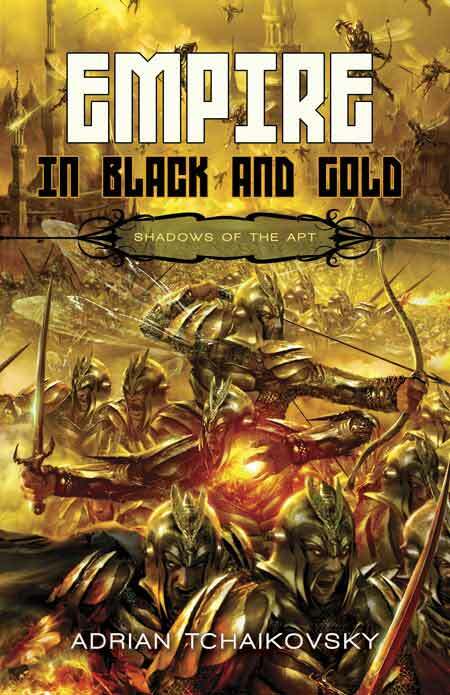 The basic plot of Empire in Black and Gold follows the Beetle Kinden, Stenwold Maker and his attempts to convince the rulers of his home-city of Collegium that there is a vast and bloodthirsty enemy coming from the North to conquer them: the Wasp Empire. As the novel opens we see Stenwold many years earlier in the city of Myna as it is besieged by the Wasps; we see firsthand the scale of destruction they’re willing to impose to get what they want. The narrative then jumps forward to an older Stenwold, now training his own group of wards who will be pulled into the next war with the Wasps. There’s no denying Adrian Tchaikovsky has created one of the most original and captivating settings I’ve ever read in epic fantasy. I wasn’t sure about the Insect-Kinden idea going in – so much so that I put off reading the novel for a long time. But it really does work. It makes for a gripping read where everyone has genuinely different abilities, social (and cultural) ideals and varied ways of looking at their world. The Apt and Inapt thing threw me a few times (much moreso than the Insect-Kinden) as I just couldn’t quite grasp that anyone would find using something as basic as a lock on a door so baffling. It makes for an interesting idea: a direct antithesis between the old (magic) and the new (technology) but didn’t always work. I imagine it could be something that may become of more importance later in the series. The characters in Empire in Black and Gold are really quite fascinating. Due to the differences between each Kinden, there are relationships and character traits which are very unusual and Tchaikovsky does an admirable job of relating them to the reader. Although Stenwold is very much a central character, his four wards – Cheerwell (Beetle), Tynisa (Spider), Salma (Dragonfly) and Totho (Halfbreed) are the real agents of the plot. Tynisa in particular stands out as a particularly strong character, her plot becoming entangled with Stenwold’s in the most surprising way. Salma and Totho get short shrift, with the focus remaining mostly on Stenwold, Cheerwell and Tynisa but they remain interesting enough that I expect some great things in Book 2. The side characters also standout here, with two in particular being elevated to main cast status (no spoilers) and having many of the most memorable scenes. Perhaps the most interesting is the main antagonist who gets a significant chunk of the book to explain his actions within his own POV. He’s definitely more anti-hero than villain. The main issue I had beyond some characters being served better than others, was that often Tchaikovsky headjumps within scenes. One moment you’re in Stenwold’s head, the next in Cheerwell’s and it can be a bit jarring. The plot definitely uses many of the classic tropes of epic fantasy (group of adventurers must stop encroaching evil with help of wise old mentor) but it really is just a setting-off point. 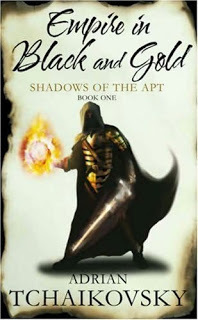 The Shadows of the Apt series looks to be doing what it wants, when it wants. The absolute last thing I can say for Empire in Black and Gold is that it’s conformist, because it just isn’t. This is original and superior epic fantasy that deserves a wide audience. The action is breathtaking, the story is surprising and there’s 9 more books of this to come. I’ll be reading Book Two, Dragonfly Falling, as soon as I possibly can. An excellent read.